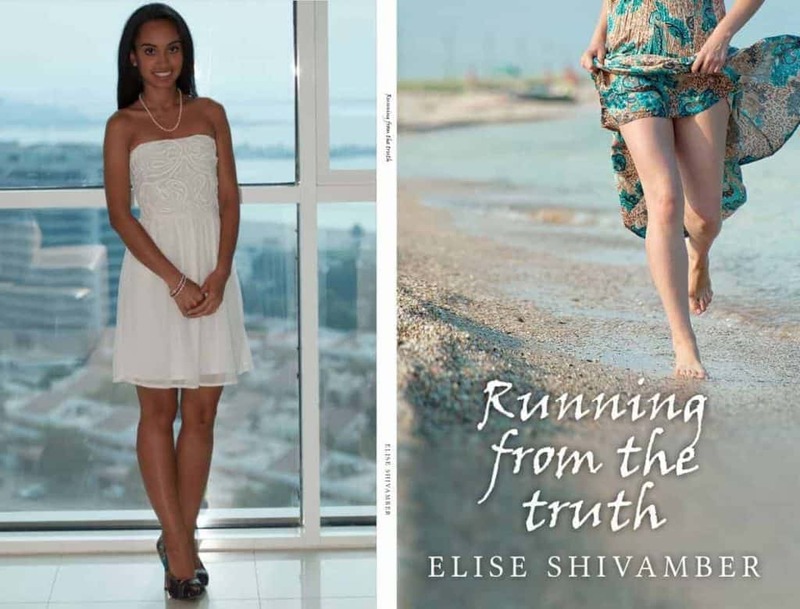 Running From The Truth started as an essay Elise wrote in the eight grade of her high school in Florida. Her sister and friends read the essay, loved it, and begged her to keep writing more. She kept writing and they kept reading and asking for more. She had a complete story before the end of the school year. Her sister cried when she read the complete work. Elise kept editing and refining, and finally published the book on July 1 this year, while on vacation in France. High school and Teen drama are not my genre, but I loved it, and I am proud of Elise! The sand squished between my newly manicured toes, as the waves called my name. I threw off my old wrinkled camp t-shirt, and it landed in the middle of the fuchsia floral towel. I took a huge breath of salty air in, and released it a few seconds later. Another wave crashed as I took off my new sunglasses and placed them gently in the bright yellow beach bag I had gotten as a birthday present. I jog towards the water line. “Arianna!” I hear again. I start to sprint faster towards the gentle waves calling my name. I scramble to my feet and slump to the front of the bare classroom. I look down at my crumpled paper and look up to my only best friend in the class for help. Loraine looks at me with her huge blue eyes, and flashes me a thumbs up. Her compassionate and kind face calms me down, a little bit. Breathe in breathe out, I think to myself as I unfold my paper. “Uh I call this ‘Betrayal’.” I mumble slowly, as I reread my words quickly. I was starting to think that reading this poem might not be such a great idea. People could possibly know whom this is about. Here I go anyways, I think to myself. to not do what you did to others before. Betrayed is exactly what I am. to curl up in a ball and cry my sorrows away. You played with my heart. You played with my soul. You played with my mind. She is the reason I cry myself to sleep at night. She is the reason for me hating you. She is the reason we can never be together again. to get over the one he truly loves. You made me see that life isn’t just composed of optimism. But it’s also composed of hatred and betrayal. I fold my paper, walk back to my desk and slouch down in my hard plastic seat. I look around and notice that everyone’s mouths are wide open. They all stare at me, and I start wondering if I said something weird or worse, wrong. “Arianna. That was … wonderful! I didn’t know you had it in you!” Mrs. Gonzales states, as she writes down something on her handy-dandy clipboard. “Um, thank you. I was just writing it. Well sort of.” I reply back, as I start to blush. “How on Earth did you come up with that beautiful poem dear?” Mrs. Gonzales questions. Wait, did she just call me dear? Weird. “Um. I don’t know. I was um watching uh Hannah Montana, I guess,” I totally lie. I would never tell them about what, or whom, the poem was really about. It was about the one and only thing that haunted me; the truth. Only my really close friends would know the one person this poem was all about. The one who used to be the closest to me. The one who was the real reason for this poem. The one who gave me all of those heart-wrenching and painful feelings. The one who is the reason for every tear during a sad love-song, or every sigh when I walk down the hallway, alone. The one person behind every laugh I had for a while, and even all of my smiles for a long time. Maybe even every feeling I ever had, thinking just one person liking me was enough. Maybe. Just maybe. HE, was definitely not Hannah Montana, I know that for sure. HE was my best friend. HE was my life, for a while. HE was the reason for my tears on my mascara-wearing eyelashes. HE was the topic of all my notes to friends for a long time. HE was the reason for my break-ups. HE was everything to me. That is badass. You must be amazingly proud. Congratulations! Thanks Sebastian, we are very proud of Elise, and her sister Sara. Shyam, I loved the dedication also! She worked hard on it, let her know what you think. I am biased! Vanessa, We are very proud of Elise (and her little sister). Hope you like the book. Cheers! We have a copy! Love the dedication to you, Daddyo!! You must be so proud Will have to get it . Previous Post:Warning: Innovation Is Killing Your BusinessNext Post:Are you at risk of creating a Snowden problem in your organization?